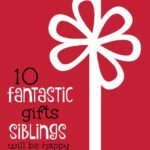 Knowing how to get siblings to get along can be a bit overwhelming. The sibling dynamic is an interesting one. While sibling love is the goal, allowing for it to be a space for learning and growth is important too. Encourage Team Work. These sibling teamwork games will have your little ones working together and having a blast. 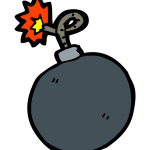 Help them manage conflicts. One of the great things about sibling relationships is they can be a safe place to learn about conflict resolution. And once they understand how to use it… you get a break from being involved! Show them what siblings getting along looks like. Read kids books, watch shows, and movies that promote sibling love or siblings that figure out how to get along. Check out some of our favorite sibling books. Stay away from those that make sibling relationships a constant battle. Make a sibling kindness list. Read this list of 10 Ways to be Kind to Younger Sibling from Toddler Approved, then help your kids come up with their own list. Write the list out and post it on the fridge. Teach them the art of negotiation. Help your kids learn how to use words and problem solving strategies so they can confidently handle their own sharing issues. Not Just Cute breaks down this let’s make a deal strategy. Prepare for new siblings. For those of you getting ready for a brand new sibling stock up on some books about babies that will help make the transition feel less overwhelming. This books about babies list from No Time For Flash Cards is great! Invite cooperative play. Have plenty of sibling toys and activities that encourage them to play together. 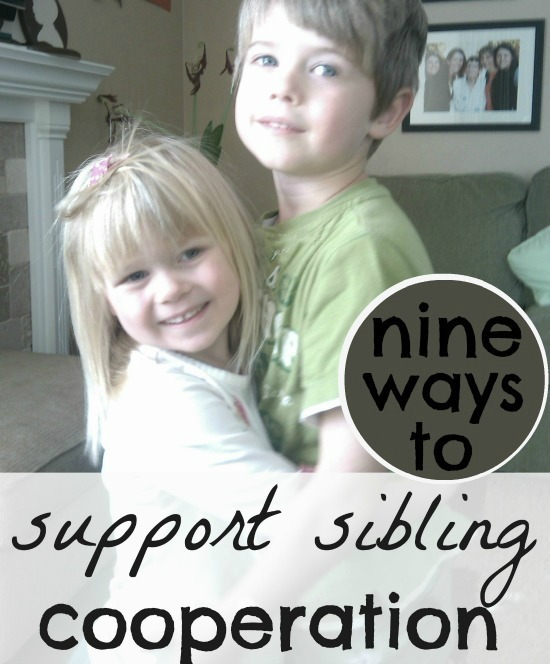 Do you have tips for how to get siblings to get along? Add them in the comments! This post originally appeared on Aug 10, 2012. We cook together! While my kids are different ages, each of them is able to help gather ingredients and measure. The older kids get harder to reach items, measure liquid ingredients and read the recipe instructions. The younger ones stir and measure dry ingredients. Everyone eats the finished product and it’s an activity we did together. That’s a fun and easy way to build a cooperative spirit. LOVE the idea of a sibling book…my kids love to craft (Smashbooks). Making a sibling book together and then planning opportunities to get photos of fun and cooperation will motivate my munchkins to play more cooperatively 🙂 Will have to share this idea with my friends !! Thanks! Don’t ever compare them. “So-and-so is more creative, Such-a-one is more sporty.” Kids already compare themselves, and it harms relationships when parents rank them, too. Play games that everyone can play on some level. My favorite was “Who Says?” It needs no equipment, and is really hard to keep score. A child asks “Who says Tut Tut, it looks like rain?” and someone answers “Christopher Robin!”, and then gets to ask a question. My kids shared a lot of material read aloud, or taken from favorite videos, so there was a good base to develop questions even though there was a 12 year age span from oldest to youngest. What a fun game Amy! We’ll have to give it a try. Amy, could you tell me more about your game idea “Who Says?” ? It sounds like a lot of fun! I have a 6 1/2 year old boy and a 3 1/2 year old girl. She LOVES her brother but he finds her a bother almost all the time. Looking for some recommendations on BOOKS we could read together. Anyone? Here’s a sibling book reviews, hope they help! We also love What Brother’s do Best by Laura Numeroff. It’s a flip book, one side for brother’s and one side for sister’s. Hi Jill! It’s your neighbor Elisa 🙂 I am currently in training to be a psychologist, and have been looking around for ways to help a sibling pair overcome some of their difficulties. Came across your website, and am so thankful I did! Can’t wait to use a few of these in therapy. I’ve also used your balloon word game to discuss feelings and kids love it. Thanks for the helpful suggestions.